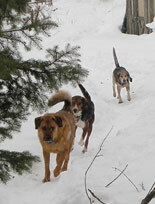 Ivan leading KC & Yumi up the yard during the snows of '10. Finally ~ our new order of CR!FR SHIRTS has arrived! with a powerful message, & LONG SLEEVE T's with awesome SLEEVE DESIGNS!